You’re wrong if you think Technology can’t help you expand. Its 2018 and the technology that we were witnessing today is astonishingly powerful and becoming efficient by the hour. Perhaps the former reasoning can be observed by looking at different sectors of every industry, it clearly portrays the effort made from centuries to make human life easier and comfortable. Technology is a multiplier of growth. “The ability to understand technology and implement its features into one’s business is the ultimate pathway to make daily operations smoother if not easier. Although sailing through smoothly is not realistic, but the struggle of going through such a process becomes the defining moment for that change. In any sort of occurings, a business big or small has to go through some bumpy rides that help them evolve as better and more manageable organisations in the future. In order to flourish and grow one’s business, the owner or the partners have to indulge in hardships of every nature. The idea of implementing any kind of technological gadgets or softwares does bring in skepticism, although referring to almost a dozen million businesses over the globe doesn’t give you that option. In fact Australia has been one of the countries with the fastest penetration rate for Internet usage being nearly 90% in the past year report of 2018. Technology has probably been the most responsive governance system to grow your business from the beginning of industrialization. Creating an atmosphere where humans can practically do anything on the touch of a few buttons on a button-less phone is something a business owner from 1990’s probably won’t understand using his Pager. The reality brings front the rule for any business to prosper in fast paced technologically advanced world. The disruptors of any and every industries are sitting behind a phone screen figuring out the next move for their business. It definitely showcases the need of the hour and gives a straight message to the traditional business owners to understand the opportunity being given. This fundamentally means recognising what matters to the business in the long run, then syncing those goals with the organizational needs. A very famous example that played its cards on time and convenience factor was Uber, they are still in the process of disrupting the transportation game but are already valued over 68$ Billion for the long shot. Imagine, if the tiniest bit of improvement could bring in 5-10% more return to your business every month. All of this without the hassle of maintaining it and with the option of further growing it. ClientsKey is a brand that’s trying to achieve a paradox of productivity and efficiency for any service based business. In less than half a decade, the product offering has been developed to successfully penetrate into the Cleaning industry. In return this has provided a handful of insights and various approaches that can be used to achieve higher integration rate in the future. The globe is going digital and so should everyone else, to conclude technological intelligence is here to help human industrialization. The scope of tech industries have been on a steady rise and so are the companies leveraging their technical work on them. Technology changes us, But it exposes the unworthy. Service based businesses around the world and in Australia have been slowly taking the initiative of implementing technology into their daily operations. The speed of penetration for something like an ERP system has been slow, However majority of large scale enterprises have started to test and try such tech savvy options for the future growth of their business. From the past couple of centuries, technology has helped us form perceptions and make things easier for businesses and their workers, At the verge of this autonomous leap – the media with the help of end consumers have gained a significantly strong leverage over any business. A single opinion can shape a totally different brand image for your organisation in a span of just a few days. Earlier this month in an article by By Henrietta Cook in ‘The Age’ mentioned how the Education Minister James Merlino has ordered audits over schools across different states as the news about Cleaning shambles vent viral. Parents and fellow teachers have been recorded complaining about dirty classrooms and surroundings. There were workers who were getting paid less by the hour, they came out in open complaining about their own organisation and their way of handling operations. This led to further investigation and the contractors in the Victorian Cleaning sector have welcomed this by all ends. It portrays the fact there are some ill-practices happening within the Cleaning industry, but a good majority of the players are ready to go under scrutiny. This can be seen as confidence in the quality of work being provided by such companies as well as the skill-set required to be running such operations on a regular basis. The fact that everyone and anyone can expose any vital aspects and ill treatments by any such organisation or contractor brings a lot of responsibility and management to that particular personnel. This has made the cleaning space turn into two extreme ends that are completely opposite, the ones that can lead on and improve upon their operations in the long run can and will be willing to succeed. The lateral could be all the dodgy operators who are trying to scam their customers and employees on some end, These are the ones who are reaping benefits cause of the lack of accountability on their end. A fair share of accountability comes to the employees and also the customers, as the cleaning industry is vastly growing maintaining standards and delivering quality work is the utmost priority of any organisation. Constant communication and providing everyone the tools to integrate and improve upon their overall services is the way to succeed in future. As the growing economy becomes more smartphone oriented and every stakeholder in the Cleaning business becomes aware of their duties and responsibilities, technology can help guide us to a more comfortable future. As the tech-revolution continues to evolve organisations from every sector are trying to implement softwares and tools which can help them manage, track, and control various aspects of their business. Automation in sectors like CRM and Accounting are on the rise in a Business to Business environment, However when it comes to Business to Customer (B2C) market the end consumer needs to have some sort of control and so do the people involved in the organisation at different tiers. This will help eradicate the problem of hiding certain factors in such large scale industries, better tracking and management will assure the quality of service being provided and maintaining it over the long run. The Enterprise Resource Planning (ERP) spectrum has been on a magnificent rise in businesses lately, the overall development of ERP systems around major industries has influenced and increased adoption of such systems in small and mid-size organisations. It gives more control and better management to the Operators of the business. Prakash Somarathne, Co- Founder of Clients Key has been a part of Cleaning Industry since over a decade. Later into his career as he became a part of the management team, he figured out the regular constraints of running a Cleaning business. Unavailability and lack of information, along with tracking and managing multiple sites at a time was impacting the performance and efficiency of the business. His personal urge and the team at Clients Key brought a solution to the table and have been profoundly improving upon their technology over the years. As Classification of Tier I ERP systems are becoming obsolete, customisation has become the mainstream accepted practice in the industry. The team at Clients Key is totally client centric and believes in serving to the requirements of the end client. “Every business is after a different set of solutions and understanding such trends and reviews from our existing clients has helped us evolve over the years” -Prakash.S . Implementing an ERP into a cleaning business would not only provide more control and better management at first. It also gives the opportunity to focus on other aspects of business which can help in client generation and retention. It allows a business owner to schedule their time in a better manner and at the same time be informed about the running operations through laptop or a mobile application. Being the only product in the market that offers Human Resource management, Client management and Operations management on a single platform, Clients Key is way ahead of its competitors already. In addition to that Clients Key also offers Key Performance Indicator (KPI) metrics which help determine the overview of the current patterns and trends in the business. At the end of the day a service based business can help another service based business by providing value which helps them scale in the long term. Clients Key feels confident in their abilities to offer you such service on your Palm. It’s the dream of most business owners to attract high-end customers. These are the clients who are concerned with quality, not cost, and they can make a massive difference to your profitability and success. Effective marketing is the key to growing your cleaning business. But if you’re not overly confident in self-promotion and only have a limited budget to work with, it can be hard to know where to start. The good news is, that you don’t need to spend a fortune getting your marketing message across. There are lots of simple, inexpensive and even free ways you can reach potential customers and win them over. When you run a busy cleaning business, it can be a daily struggle to keep up. Staying on top of scheduling, resources and workflows can take up a fair chunk of your time, not to mention the paperwork at the end of the day. Finding the hours to promote your business, grow your brand and effectively manage your job specifications can seem like an impossible task – but thankfully, there is a better way. There are some fantastic tech tools available that have been designed to help business owners save time, increase efficiency and get ahead of the competition. By automating some of your processes – like marketing, social media and job specs –you can free up more hours in the day to focus on the important task of growing your business. If you’re running your own cleaning company, you’ve probably got your hands full managing daily workflows, resources, staff and clients, which leaves you little (if any) time left to focus on strategies to grow your business. However, if you want your cleaning company to be a long-term success, it’s important to devote some time and effort to planning for the future. To stay relevant in the competitive and ever-changing commercial and residential cleaning marketplace, you need a good strategy for future growth. While some cleaning contractors are happy to keep doing what they’ve always done, if you want to become an industry leader, you need to actively find ways to adapt and improve your cleaning business. If you’re looking for ways to take your commercial cleaning company to the next level (and who isn’t), you’ll need to think outside the box. These days, you can’t rely on great service and quality work alone – it takes more than that to give you an edge over your competitors. All business owners and managers essentially want the same thing: bigger profits, an efficient workplace, and happy customers. When you’re running a cleaning company, this means having your back room sorted with good systems in place, keeping up to speed with the latest industry developments, and delivering quality work and service to your clients consistently. 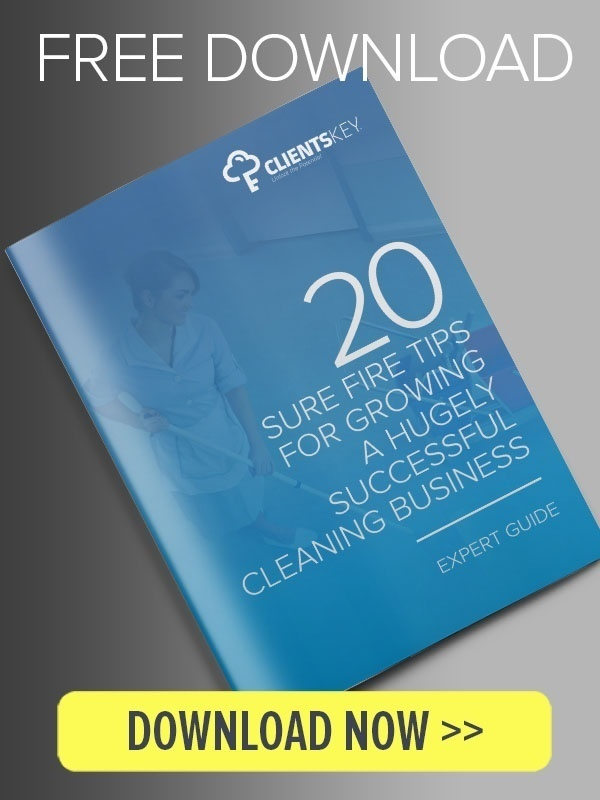 The most successful cleaning companies have nailed these key areas, and you can too. Here we’ll share four tips to help you boost your profits, work smarter and impress your clients every time. What is in a Good Field Service Management App?